Pregnancy is a magical time, but it comes with its complaints. As if nausea, vomiting, extreme fatigue, weight gain, sweats and round ligament pain weren’t enough, we can add sudden, painful leg cramps to the list of common complaints in pregnancy. These painful spasms are most common in the second and third trimesters and usually happen when you’re trying to finally fall asleep after a long day - perfect timing, eh? Perhaps they’re part of the training to prep you for the constant unpredictable needs of a newborn? What Causes Muscle Cramps in Pregnancy? According to What to Expect When You’re Expecting, no one is quite sure the exact reason why pregnant women get these cramps, but there are a couple theories. Some say it’s muscle fatigue from carrying the extra pregnancy weight. Other theories suggest it comes from fluid accumulation in the stems. It could also come from compression of the blood vessels or your diet - too much phosphorous or too little magnesium. And finally, it could just be down to pregnancy hormones since they’re responsible for a lot of the changes (good or bad) you’re currently experiencing. Since some of the research suggests these cramps come from muscle fatigue and fluid retention, a few gentle yoga stretches can be a great addition to your prevention plan. Once you’ve spoken to your doctor or midwife about electrolyte imbalance/diet and have the ok to exercise, give the following six postures a go to alleviate at least some of the tension! One of the four most important poses in all of yoga asana, Paschimottanasana stretches the entire back body, and is a perfect way to work into the gastrocnemius (or calf muscles). Extend your feet in front of you, but rather than connecting the feet, ankles and inner thighs, make space for your expanding belly by spreading them to about hip width (the space between your thighs will depend on the size of your belly). For prenatal students, I suggest leading the forward lean with your sternum and a nice flat back, rather than rounding the spine and placing the head beneath the heart. This is particularly important if you suffer from low blood pressure. Flex the toes toward the knees and face to really work into the calf muscles. Use a towel or strap as needed to modify the pose. Hold for thirty seconds to a minute depending on your comfort level. 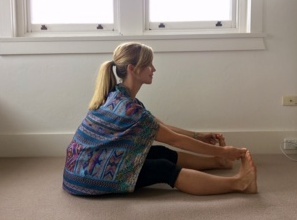 This is an intense stretch for the side of the leg - another common area for cramps. It can also work into the calf muscles and release tension in the hamstrings. For pregnancy, modify by only extending your torso forward until it is parallel to the floor, rather than curling over completing and taking your forehead to the knee. Another great modification for pregnancy is to use the support of a wall. Lean forward from the hips with a flat back until your torso is parallel to the floor. Reach your hands forward to the wall, fingers pointing up, and press into it to adjust the intensity of the stretch. Hold for thirty seconds and switch sides. Ardha Hanumanasa or Half Front Splits Pose is a beautiful posture for pregnancy leg cramps that strengthens and stretches the hamstrings, calves, and hips. It’s also one of my favourite poses for relieving sciatica pain - an intensely uncomfortable and debilitating pain a lot of pregnant women feel towards the end of gestation. To modify for pregnancy, rest your hands on your hips, on blocks on either side of the extended leg, or simply ‘tent’ them around that front leg. Adjust to make space for the baby by placing your extended leg out ever so slightly toward the outer edge of your mat, rather than forcing it down the center. Again, adjust according to the size of the baby. And finally, keep your head above your heart and lead with your sternum (or breastbone). Hold for thirty seconds and switch sides. Pigeon pose opens the hips and releases tension in the iliotibial band created by walking, sitting, running, and cycling (pretty much everything we do on a daily basis!). It also lengthens the muscles in the hips, glutes and legs. Modify for pregnancy by using a bolster to support your head when you're bent oover, and a blanket or block underneath the glute of the bent/front leg, even if you don’t usually use one. Allow the belly to be soft the whole time and only lean forward as much as is comfortable for your belly bulge. Hold for as long as feels good. Many pregnant women also experience cramps in their feet and toes. 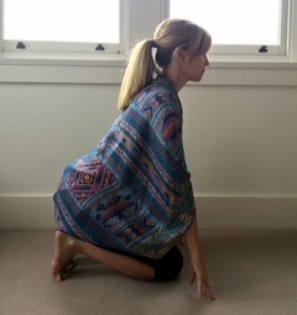 A Toe Squat is a traditional Yin yoga pose that is not only good for stretching all of the toes, the ball of the foot, and preventing bunions, but also for activating the lower body meridians. Added weight of the baby can make it a bit more uncomfortable, so roll a blanket up for underneath your knees, or lean forward and take some of the weight into your hands. Hold for one minute. To come out of the pose, lean forward, untuck the toes and rest into Hero’s Pose for a few moments to soak up the benefits. Finally, drain the legs of the extra fluid that could be causing those cramps with a modified Viparita Karani. Place a few blankets under your sacrum, extend your feet up the wall and feel the blood (that has been stuck in your tired, swollen legs all day) drain from them and recirculate into your lower back, hips, and glutes. This gives those legs a much needed rest from carrying around all the extra baby weight or even just sitting at your desk all day. Hold for one minute and roll to your side for a proper savasana. So while we might not be able to help with all of the aches and pains over these nine increible months, we hope you can incorporate one or all of these beautiful yoga asanas into your wellness plan. Keep us posted on how you go, in the comments below, we’re keen to know!